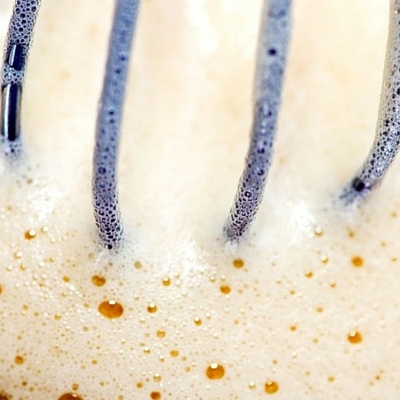 Specific Gravity measures the amount of bubbles you have in the batter. Specific Gravity is a way to measure the air added into cake batter. It shows the amount of aeration, or air movement, in specific batters, allowing bakers to determine if it is too dense or not. Specific gravity measures how much aeration takes place in the batter by comparing the weight of the batter to the volume it takes up. Specific gravity = x/y, where x = the weight of batter in a container and y = the weight of water that fits in the same space inside that container. For example, if the container holds 100 grams of water, and weighs 80 grams when filled with batter, the specific gravity is 80/100 or 0.80. With aeration, specific gravity is usually between 0.40 to 0.80. A specific gravity of close to 1.0 would indicate that batter had fewer air bubbles incorporated into it. If it’s too high (insufficient volume of air cells and low batter viscosity), the cake will exhibit reduced volume and dense grain. On the other hand, if it’s too low (indicating that the batter has too much air cells and a high batter viscosity), then the cake will result in some tunneling, be fragile and have a crumbly crust. Edoura-Gaena, Roch-Boris, Irène Allais, Gilles Trystram, and Jean-Bernard Gros. “Influence of Aeration Conditions on Physical and Sensory Properties of Aerated Cake Batter and Biscuits.” Journal of Food Engineering 79.3 (2007): 1020-032. Web. O’Brien, Richard D. Fats and Oils: Formulating and Processing for Applications. Boca Raton: CRC, 2009. Print. Desrochers, J.l., K.d. Seitz, and C.e. Walker. “CAKES | Chemistry of Baking.”Encyclopedia of Food Sciences and Nutrition (2003): 760-65. Web. Jyotsna, R., P. Prabhasankar, D. Indrani, and G. Venkateswara Rao. “Improvement of Rheological and Baking Properties of Cake Batters with Emulsifier Gels.” Journal of Food Science J Food Science 69.1 (2004): n. pag. Web.